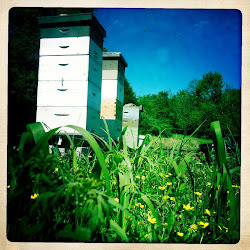 Every day there are more and more women becoming beekeepers. This is no longer a man's hobby. I think that's great and that there is room for everyone! A common theme I have noticed however with the female beekeepers I work with is a lack of self confidence when it comes to woodworking and making your own beehive components to save some money. Let's face it, this hobby is not the cheapest out there. There are some rather large companies that have grown so big because you and I do not want to be bothered by having to cut, sand, and manufacture woodenware. I'm here today however to tell you that it doesn't all have to be made by someone else. You too possess the means to make some hive components on your own. And it's easier than you think. Here's today's example: Migratory Covers. 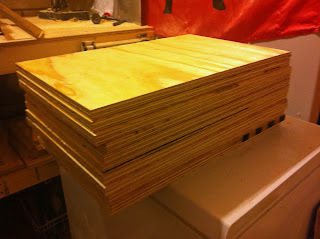 Yesterday I went to my local Lowes and bought (1) 4x8 sheet of 23/32" utility plywood. I had a store employee wheel it over to the cutting station. I then had him cut (12) pieces each with the dimensions 14"x22"
I also had him pick up (8) 2x4's and cut them into pieces 14" long. I had him place all the wood back in my cart. I could have even had the employee wheel the cart out to my car. I was lucky and he didn't charge me for cutting any of the wood. Even if he had, it would have cost less than $5 for all the cuts. I took the wood home (without having to lift any of it) and found some old nails, screws, and glue around the house. I nailed and screwed the wood together and....voila I have 12 new migratory covers. If I wanted, I could have bought some "oops paint" for $5 per gallon and painted the cover for extra insurance. Remember, I did this without any sawing or heavy lifting. All I needed was a screwdriver or hammer. In the end, my grand total for 12 new migratory covers was $33. That's $2.75 each! "But Jay, what if the plywood warps or falls apart in a year?" I say, who cares. Throw the warped cover out and grab a new one. I've got covers that are 3 years old that are just as good as the day I put them together. The moral of this story is use your resources. 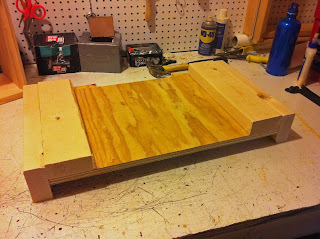 Just because you don't have a fancy wood shop out back doesn't mean you can't save some money and build your own components. I have minimal woodworking skills and I'm able to hack my way around all this. You can too. The help is out there. Take advantage of it! You've inspired me. I usually just wimp out and let my hubby do the woodworking, although I do assemble hives and frames! I really want to take a course and learn a few tricks. It frustrates me that I don't know how to build things, because I'd really like to be able to do that, and I figure all the measuring and fitting skills I've learned from graphic design and quilting would be applicable to woodworking! Thanks for the comment! I actually just finished giving a talk on tips and tricks at our state bee convention. It was so much fun. Hopefully I'll get the opportunity to do it again. More people need to trade secrets!